How well do you know your shapes (square, rectangle, circle, oval, triangle)? 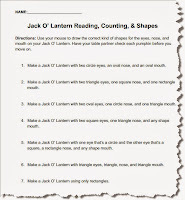 Use this worksheet to draw the correct kinds of shapes on each Jack O' Lantern. Have your partner check your screen when you finish each round. Good luck! Time for some Halloween fun! Next, open up Kerpoof's Spell a Picture and select the Halloween scene. Test out nouns you know how to spell, then add a noun to the Smart Board if it works on your scene.